Today is Day 3 of the Global Congress and OpenAIR conference in Cape Town, SA. It also marks the shift of focus from OpenAIR to the Global Congress per se. The day began with, among other things, a summary of activist activities in Canada against oppressive copyright legislation. It seems that Canadians are relatively [at least relative to Kenyans, grumbles this Leo] easy to mobilize on this topic. When the Canadian government began discussing DMCA-type legislation, 30,000(!) physical letters [who writes physical letters these days?] flooded the government from citizens concerned about the way that the proposed legislation would restrict freedom in copyrighted works. Prof. Ben Sihanya, a copyright expert at the University of Nairobi, pointed out that there is a ceasefire between the pro-copyright camp and the no-copyright camp, and the ceasefire is brought about by the Creative Commons. He stated that we should seriously explore the Creative Commons option to opening information within the context of a protection regime. This position is very consistent with Tobias Schonwetter (Director of the IP Unit at Cape Town University), who opened the Global Congress by urging attendees to look for common ground between pro- and anti-protectionism. Prof. Sihanya also cited the effort underway in Kenya to combine all IP authorities within one government ministry as an example of an attack on copyright and, particularly, on open access. The logic is that governments usually focus more resources on patents at the exclusion of copyrights, and by combining the two offices into one authority, copyright will further suffer. At this moment, it seems likely that the effort will sail through government with little/no opposition. [As noted above, activism in copyright issues is difficult to mobilize in Kenya.] This Leo is very curious whether readers feel that it is good to combine all IP offices (as is done in the UK, for instance) or whether it is better to keep the offices separate (as is done in the US, for instance). Please do share in the comments. The order of the day (thankfully!) seemed to be in presenting IP activism activities with humor. Sunil Abraham provided a hilarious talk on The Freedom Continuum. An example: “Freedom is like the Kama Sutra – there are many positions one can take.” Mr. Abraham also brilliantly suggested a method for plausible deniability in the world of biometric identification and oppressive government oversight. By posting all of my biometric information (fingerprints, eye scans, etc.) on the internet, I can plausibly deny any crimes or contracts or tracking by the government because, well, it’s all online so it couldn’t have been me, right? So we should (paradoxically) fight incursion into data privacy simply by releasing all biometric data about ourselves. 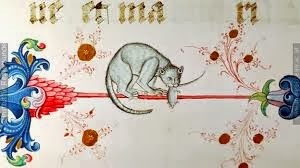 Cats have been chasing mice for a long, long time. Also quite amusing was the comparison of the IP debate to Tom and Jerry, that iconic Cat (Kat?) and Mouse duo who are perpetually chasing one another. Tom the Cat represents Big Business, corporate interests, the USTR, etc. Tom is chasing (but can never quite catch) Jerry the Mouse, who represents civil society, human rights activists, the open source movement, etc. An audience member pointedly observed that Jerry typically runs around for a bit and then disappears into a hole in the wall, where he stays for some time before emerging to torture Tom again. The obvious point is that activists (i.e., the audience at the Global Congress) will never make substantial progress until they stop disappearing for long periods of time and start acting more like a cat (or even, perhaps, like a dog). This Leo finds it curious to be a Katfriend and yet to sympathize and identify largely with mice. Love the humour! Here some more, primarily to avoid the reporting on the Open Air Confernence becoming entirely self-referential, a hot air baloon over Africa. Blame Canada: More than 50,000 local authors and creators signed a petition against the atempted copyright abolition in Canada. Do you think they were all wrong? Suggesting that the Canadian law is commendable is like offering Jerry just the holes in Swiss cheese, without the cheese. Clearly Jerry should have all his bio-metric information on the web so people cheering him on can see that either Jerry is genetically really a Wallaby, or that Jerry is a kind of Frankenstein version reprogrammed and used unfairly by Dr. TechCompany - in either case, the mouse plays unfair which makes harming Tom less acceptable. Hopefully one day Tom & Jerry can reconcile and recognise that they have been played off agaist one another: they do not fight over who gets the cheese and who gets the holes; instead they become aware that both are someone else's meal (the dog or Dr. TechCo? - on the Internet nobody would know).